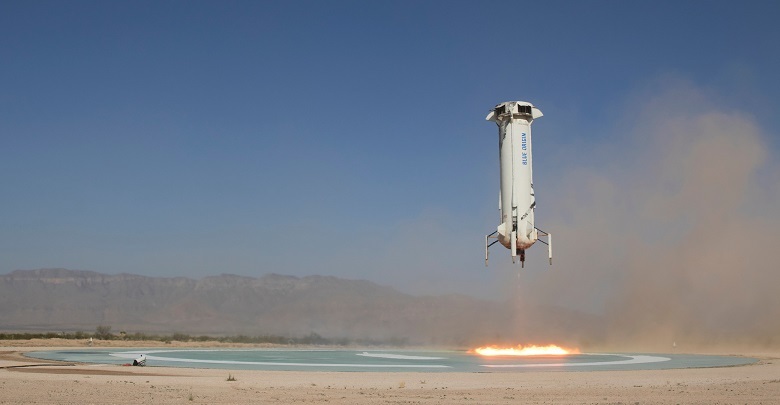 On July 18, 2018, at 8:35 am PDT, Blue Origin successfully launched its New Shepard rocket from the company’s West Texas launch site with five NASA-supported technologies onboard. For each of these payloads, this flight was one in a series of suborbital demonstrations to facilitate technology development. The flight helped researchers collect critical data to help them confirm theories, refine previous results and fine-tune experiments for future testing. Selected for flight test by Flight Opportunities, many of the payloads on this New Shepard flight aim to provide value to other payloads on future flights. For example, a sensor package developed at NASA’s Johnson Space Center in Houston will help characterize suborbital test flight environments—data critical for implementation of technology and science payloads. SFEM-2 measures critical data, such as acceleration, pressure, temperature, humidity, carbon dioxide levels and acoustic levels. This sensor package first flew with Blue Origin in April 2018. This time, the SFEM-2 team was able to test the technology for a different flight profile. Also, onboard New Shepard was the Vibration Isolation Platform from Controlled Dynamics. Designed to isolate payloads from the disturbances of flight –the platform is also capable of creating environments required for a particular test scenario. Green and his team flew a specific subset of the isolation technology on the flight, gathering data necessary to tune the full system for a future Blue Origin flight. Other researchers leveraged the flight to gather data to reach specific goals. Purdue University flew an experimental predictive technology for the control of liquid droplets and avoidance of liquid plugs in tubes—important considerations for condenser flow passage design in phase-change heat transfer systems. Such systems are advantageous for spaceflight because they provide better power capacity, lower volume and better temperature uniformity than single-phase systems. “We’re flying the experiment to test our computer simulations so that we can publish that data and show the research community that our tool is useful for designing systems for the weightlessness of spaceflight,” said PI Steven Collicott. Collicott also acknowledged that further development may be needed, depending on the results from the flight. Discovery is also key for a system designed to gather electromagnetic field measurements developed by the Johns Hopkins University Applied Physics Laboratory (APL). The objective for this flight was to characterize the electromagnetic field environment inside the spacecraft to understand the potential effects of strong external and internally generated fields on the spacecraft and payloads. Echoing the other PIs on the flight, PI H. Todd Smith noted the value of being able to secure suborbital demonstration through Flight Opportunities. Through the program, the Space Technology Mission Directorate (STMD) selects promising technologies from industry, academia and government for testing. The Flight Opportunities program has helped to test and mature 136 technologies through 162 suborbital flights. The program is funded by STMD and managed at NASA's Armstrong Flight Research Center in Edwards, California.